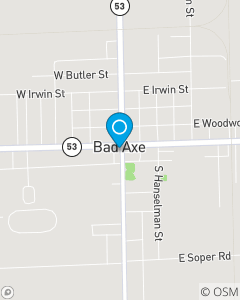 Located at the stoplight at the intersection of N Van Dyke and W Huron Ave in downtown Bad Axe. Our goal is to keep our community properly covered and secure in any way we can. We strive to be the top choice in insurance for Bad Axe, Harbor Beach, Elkton, Pigeon, Caseville, Ubly, Cass City and all of the Thumb area.